Our friend Danielle (left), who lives in Palermo and loves authentic Italian foods, takes me to explore Capo Market in Palermo (Beautiful!) and writes this lovely article, below. From Sicilian EV Olive Oil to Sicilian green almonds, in season now and in abundance at Capo! “At Gustiamo, we pair our Extra Virgin Olive Oil (EVOO) with our food in much the same way we do with our wine; matching the subtle flavors and highlights of the EVOO with the right dish. We do not dress fish, for example, with the same EVOO that we use for red meat, and we always smell our EVOO before using it. When smelling EVOO, like our own Pianogrillo EVOO, we often describe the distinctive flavor notes we get on the nose as “green almond“. 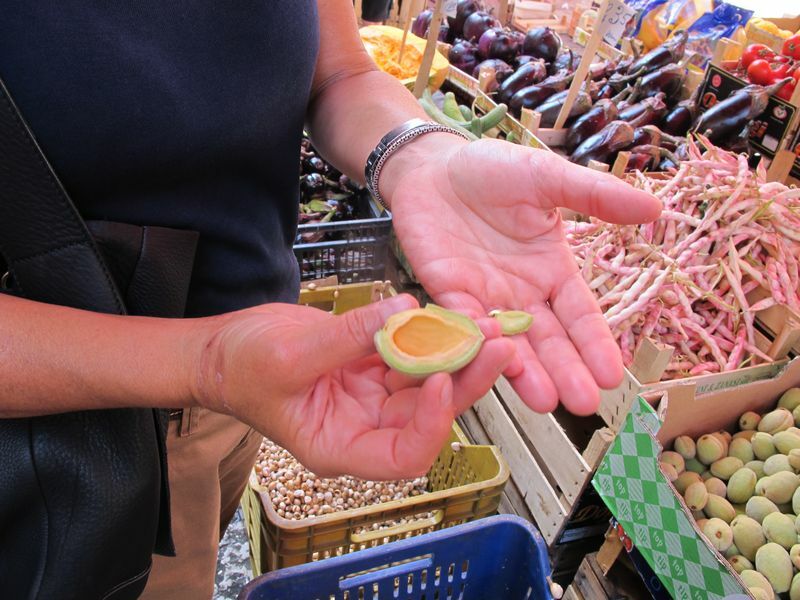 During a recent walk through Palermo, Sicily’s Capo street market, we asked ourselves the following question: How many Americans would actually be able to identify a green almond if they were to encounter one? We figured, probably not many. 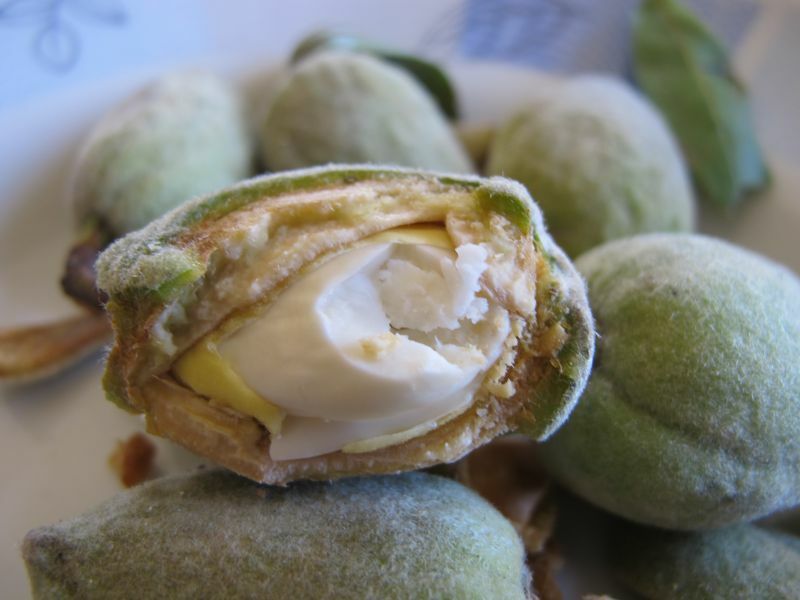 Right now, it is green almond season in Sicily and Capo is full of vendors selling them alongside fruits and vegetables. (Beatrice, left, pictured after a kind vendor opened a green almond for her to taste). Green almonds are pleasantly bitter with aromas similar to fresh cut grass. Grazie Danielle! Keep writing about your amazing discoveries. We’ll be following you. It was such a pleasure to spend time with Gustiamo in Palermo! ‘Til we meet again, next time in the Bronx! I hope You all had fan in our really characteristic town! Ciao Salvo! 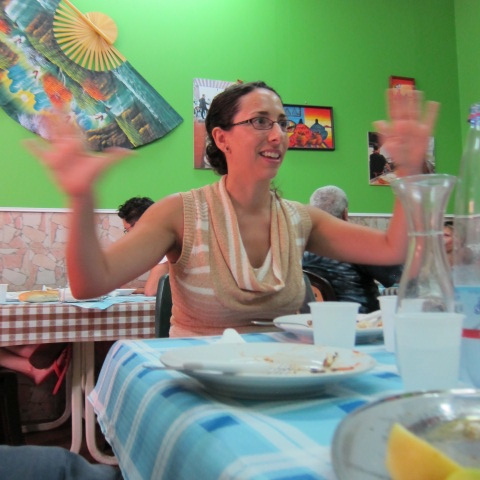 Not only we had a wonderful time, we are telling everybody how beautiful Palermo is. All our friends who have Sicily in their vacation plans will come to Palermo, also. Be prepared!!! Ciao e grazie di tutto. I had no idea green almonds even exist. As I’m looking at them it seems to me that they are really good for health, better than the average ones. Barry, you are very welcome.